Yes, I have gone flamingo. I now have a flamingo on the front of my house. No, at least they are not the pink flamingos usually displayed in the yard. This is a classy one I found on sale at Old Tyme Pottery. The bright flamingo welcomes visitors to our home. As if that welcoming flamingo isn't enough, inside my home there are more flamingos--on mugs, in photos, and even on my t-shirts for heaven's sake.This delightful figurine was a gift from my brother and sister-in-law. They were so excited when they found it in a jewelry store, they called me from the store and asked if I would be home. They wanted to drop something off. This beautiful figurine was the perfect way to celebrate. I posted a blog about it if you want to read about this very special surprise. 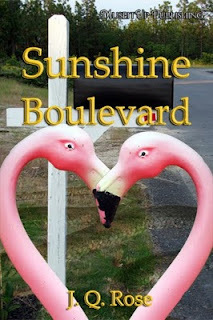 We celebrated the launch of my first mystery novel, Sunshine Boulevard, from MuseItUp Publishing in March 2011. Look at the cover and you can see why the flamingos have taken over my life. It's all Delilah Stephans fault. She is the book cover artist and selected the flamingos to grace the front of my book and signal readers the story takes place in Florida. Notice this little caveat, the flamingos are in a heart shape.--because the main characters in the story are Jim and Gloria HART. Pretty clever of Delilah. I smile every time I see the flamingos. As much as I loved the book cover, I look forward to moving on with my next mystery/sweet romance novel from MuseIt Up Publishing, Coda to Murder. It will be released in February and as soon as I get the book cover, I will put it up on display here. Hmmm....I wonder what I will be collecting to celebrate this new story! Coda to Murder--Pastor Christine Hobbs never imagined she would be caring for a flock that includes a pig, a kangaroo, and a murderer. You love flamingos and I love unicorns! My daughter collected unicorns too. They are precious creatures. I guess flamingos have their own kind of beauty. Thanks for stopping. And I love timber wolves. So, I gotta ask. If your next books about deadly frogs, are you going to change the flamingos inside and out to froggies? Let me guess. Bet your next book isn't about frogs? Why thank you, Susanne! I've been looking for something for several years for the front of the house. I guess I was destined to find this flamingo plaque. Everyone else around here has sunbursts, fish, lobsters, etc hanging on their walls. I may start a new trend!